Get started. Get obsessed. Get a higher TOEFL score. Get the score you want by building skills you need for test day and beyond. Welcome to the #TOEFLTribe! I'm Danielle, an American teacher here to help you take on the TOEFL. The TOEFL is a 4 hour test built on a variety of skills designed to make sure you are university-ready, so as you can imagine, there are a lot of topics you'll need to master in order to be fully prepared and I've got lots of tips to share with you. I don't want you to get overwhelmed by the amount of information, so if this is your first time on the site, I've crafted this page to help guide you through the site and what you need to know, when. Are you tired of seeing a test prep book on your desk, sitting unopened, collecting dust? Have you taken a practice test and your dream school's minimum score seems beyond your reach? Has your TOEFL score plateaued? Do you need to find a way to stick to that study plan even though you don't have the time to enroll and commute to a test prep class? Are you frustrated with teachers and test prep books that tell you the answer to a particular question without an explanation of how you can avoid making the same mistake? Do you hate the idea of learning strategies that you will never use after test day? Then we are speaking the same language. You've found test prep that is practical, designed for the way that modern students prepare for today's tests. I understand your struggles because I've worked with tons of students just like you. I hear your complaints and concerns. I understand that the test is probably not something that you are crazy about, but by focusing on the skills behind the questions and incorporating test prep into your lifestyle, you can reach a score you love and head to the university program you've been dreaming of fully prepared for class. This site is divided into several sections to make it easier to locate just what you need. In the Student Space, you will find everything you need, taking your from TOEFL newbie (slang for a person who is just starting out) to a TOEFL master while the Teacher's Edition helps fellow educators make the most of their time inside and outside of the classroom. Inside the Student Space, you can get started with links to high quality resources so that way you don't need to spend your time searching for advice or practice. Instead, I've done all the leg work for you so you can keep yourself focused on test prep without searching the internet endlessly. The Student Space begins with an overview of the test and basic strategies for each of the 4 sections. From there, get all the tips for mastering particular skills-- like brainstorming and paraphrasing. If you want to get even more serious and detailed about the TOEFL, invest in my Independent Essay online course. Do you have to go through every single section of the website? Of course not. Remember, good test prep is tailored to the individual's needs. Do you only need help with the writing section? Only read blog posts with those tags. Do you just need to find out where to get more listening practice? We've got that, too. Use the search bar on the blog page to find exactly what you need. There are two free TOEFL essentials that I've crafted to help you get started on the right foot. The first is the TOEFL Training Checklist. How do you know what you need to know? I've listed each piece of information you need and the skills you must have to be TOEFL- ready. 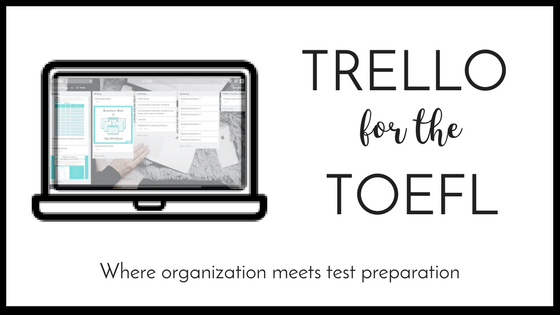 The second is Trello for the TOEFL, a set of digital post-it notes called boards that are built to keep you organized and loaded with links and PDFs that will help keep all the strategies and practice in one easy to find location. Get the Checklist and TRELLo boards! Thank you! You've taken a big first step; finding out exactly what you need to know will help keep you on track. Here is your TOEFL Training Checklist and the link to all my Trello my boards. Now take your Checklist and head over to the Student Space to read the step-by-step guide taking you through the first parts of the Checklist and introducing you to each of the 4 sections of the test. Be sure to check your email regularly for extra TOEFL tips and tricks to help you check each box on your list, and keep all those notes organized in your Trello boards!